Million Dollar Candy Bars are a homemade version of the 100 Grand candy bar. 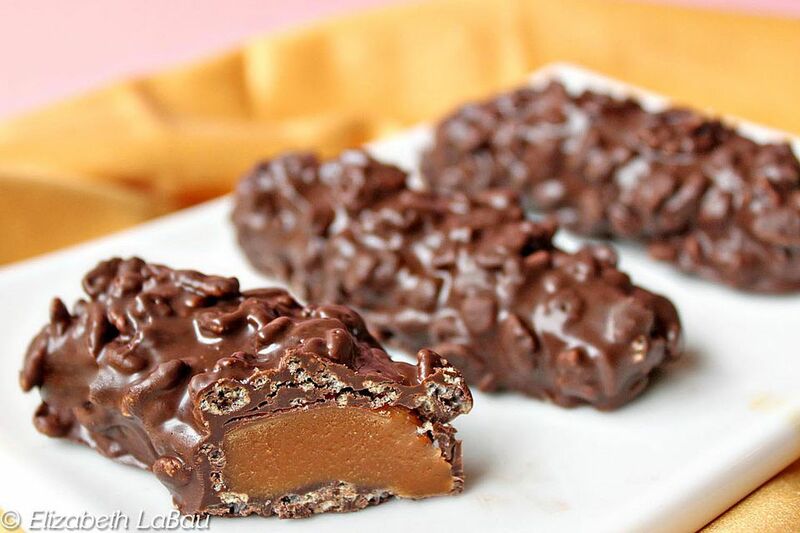 A luscious strip of caramel is coated with a mixture of chocolate and rice crispies for a crunchy, chewy treat. You can use either storebought or homemade caramels in this candy. If you buy individually wrapped caramels, I recommend unwrapping them and microwaving them in a bowl with a spoonful or two of cream, then pouring them into a shallow pan to set before cutting them. If you want to make your own caramels, I recommend this recipe for Soft Caramels. You will only use about half of the recipe. Cut the caramel into small bars about three inches long and one inch wide. Place the bars on a baking sheet lined with foil that has been sprayed with nonstick cooking spray, and refrigerate the bars until they are firm. Melt the chocolate or candy coating in a medium bowl the microwave, stirring after every 30 seconds to prevent overheating. Once the chocolate is melted and smooth, stir in the crisped rice cereal. Take one caramel bar and dip it into the chocolate mixture. I find it works best to lay it in the bowl and sort of spoon the chocolate and crisped rice over it since the chocolate mixture is so chunky. Once the caramel is covered with chocolate and crispies, replace it on the foil-lined baking sheet. Repeat with remaining caramel and chocolate. You will probably have some of the chocolate left over. If you'd like, you can drop this in spoonfuls onto a baking sheet to make clusters or spread it thinly and break it apart once set to make bark. Refrigerate the bars to set the chocolate, for about 30 minutes. These bars should be served at room temperature for best taste and texture so that the caramel is soft and supple. Keep Million Dollar Bars in an airtight container in the refrigerator for up to one week.